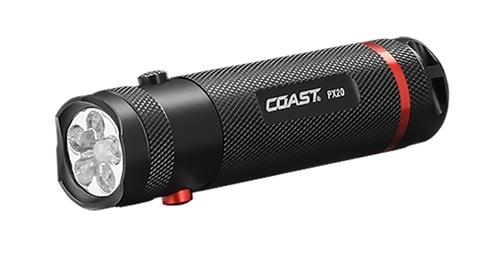 The Coast PX20 dual color utility beam flashlight features 5 super bright white LEDs and 1 Red LED controlled by push button operation. A great everyday light that keeps you prepared for either the need for bright illumination or reducing night blindness while reading maps in low light situations. In White mode, you get a great diffused beam that is optimal for up close and near distances A lightweight aluminum casing offers great durability. Backed by Coast's lifetime guarantee against defects in materials and workmanship. Popular with Soldiers for an inexpensive tactical light for night operations. Tested and rated to ANSI/FL1 standards by an independent laboratory. 155 Lumen white beam.